The Bahrain Drag Racing Championship enjoyed a thundering start to its 2015/2016 season over the weekend at Bahrain International Circuit (BIC) in Sakhir. A strong field of more than 110 participants battled it out in 10 cars and four motorbike categories, lighting up BIC’s world-class quarter-mile drag strip in front of hundreds of fans. World record holders Khaled Mohammed and Gary White helped E K Kanoo Racing Team come away with a fantastic pair of victories to highlight the meeting’s results. 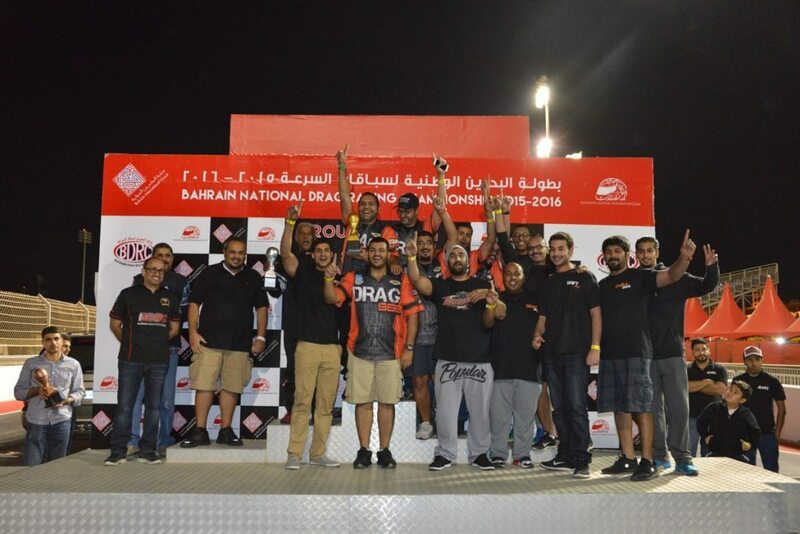 Mohammed triumphed in the Super Street V8 category while White was the winner of the Outlaw 6-Cylinder class. They were among a number of Bahrain-based drivers who took to the top of the podium on the night. The national championship is being run by the Bahrain Drag Racing Club in cooperation with BIC and the Bahrain Motor Federation. In the Super Street V8 class, Mohammed emerged as the winner in his all-new Lexus RC F after his opponent Abdulla Al Shamsi could not complete his run in the final stage. White, meanwhile, was also a comfortable winner in the Toyota FT 86. The American’s opponent Mohammed Shakeeb did not start the final. Faisal Abdulla claimed third place. Both Mohammed and White expressed their delight in starting the season on a high, but added that it took a lot of work to get ready for round one and there is still plenty to do in car development for the remainder of the year. Elsewhere in round one, Adel Hassan narrowly triumphed in the Street 4 and 6 class after winning his final against Mohammed Aljalhma. Abdulaziz Faisal was third. In the Outlaw FWD, Mohammed bin Hasher won the final race against Abdulrahman bin Hasher, who did not start. Zakreya Abdulla came third. Nawaf Almnnai triumphed in the Super Street 6-Cylinder. He won with a time of 7.950secs in beating Sayed Yahya Saeed’s 8.004secs. Saod Al Saod finished third. In the Street V8 class, Salah Salahuddin finished in first place ahead of Mohammed Sulyman. Salahuddin had a final run of 7.940secs while Sulyman finished with a run of 8.656secs. Hussain Mohammed came third. In the Competition 4.5 class, Hisham Almulla won a narrow race against Salem Nasser. Almulla had a time of 4.540secs to beat Nasser’s 4.559secs. In the Outlaw 10.5 category, Abdulwahab Saleh won with a time of 4.098secs. Abdulla Alsory finished as runner-up 10.215secs. In the Pro Mod, Bader Korshid was the victor in 3.874secs. Abdulla Al Suri came second in 8.085secs. Finally for the cars, in the Index 10.5 category, Raed Hussain won in 10.596secs. Fesail Alahmed was the runner-up and Khalid Abdulkarem was in third. In the bikes categories, Masfer Al Masfer was in a class of his own, winning both the Street Bike and the Super Street Bike. In the Street Bike, Al Masfer was in first place in 8.205secs. The runer-up was Khaled Aldoseri in 9.449secs, while in third Bader bin Edan. In the Super Street Bikes, Al Masfer ran the final in 6.822secs. Mashari Al Turki was second in 7.528secs. Khadem Alali finished in third. In the Pro Bike, Mohammed Bu Rashid won in 10.598secs. Losing the final race and settling for second place was Mashal Al Sabor in 4.214secs, and Jasim Al Sadi finished third overall. In the Index Bike 9.5 class, Ahmed Al Hadad was the winner in 9.578secs while Jehad Jalal was second in 9.777secs. Taking third place was Abdulla Munif. Following all the action, each category’s winners were presented their trophies by BDRC president Fahad Taqi. For more information on the Bahrain Drag Racing Championship or other BIC activities, visit bahraingp.com or call +973-17-450000.